Cigarette smoke contains more than 6,000 chemicals, and at least 200 of those chemicals are known to be harmful to your health. When smoke is inhaled, moist oral tissues are saturated with excessive amounts of carbon monoxide, hydrogen cyanide, and a host of other known carcinogens. Most oral cancers originate in abnormal squamous cell activity, which are cells found on the lips, inside the mouth, and in the throat. Cells exposed to consistently high levels of cigarette smoke may eventually suffer abnormal mutations within their DNA. Since deoxyribonucleic acid (DNA) is responsible for providing cells with instructions about growth, reproduction, and death, these instructions become distorted, which causes the cells to reproduce uncontrollably. Essentially, that is what cancer is: rapid, unchecked growth of genetically mutated cells that encourages the development of malignant tumors. Unfortunately, the chemicals in cigarette smoke are strongly associated with oral cancer. Squamous cell oral cancer is the most common type diagnosed in smokers. Dr. Robert Batton, Dr. Justin Harlin, and Dr. Matt Wilkinson and our staff often discover squamous cell carcinoma lesions during dental examinations or cancer screenings. Depending on the stage of the oral cancer, treatment may begin with a biopsy or an exfoliative cytology procedure that involves collecting cells from the oral cavity using a scraper. According to the Oral Cancer Foundation, oral cancer patients may need surgery, radiation therapy, a combination of surgery and radiation therapy, or chemotherapy to eradicate oral cancer. Not only is smoking the number-one cause of cancer but it is also detrimental to the overall health of your teeth and gums. 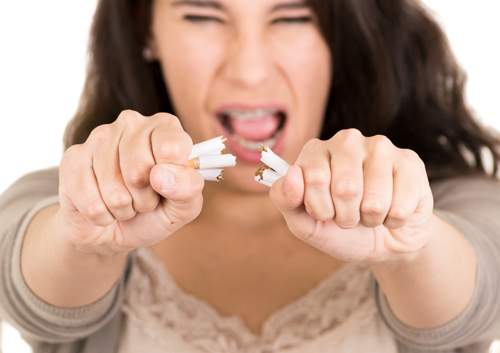 Yellow teeth, bad breath, dry mouth, and expedited tooth decay are all caused by smoking, not to mention the damage smoke does to the heart, lungs, and kidneys.